The Good e-Reader 13.3 and 6.8 are the definitive digital note taking devices of our generation! These two devices have sold thousands of units over the course of the past few years and we are proud to introduce our first major firmware update. 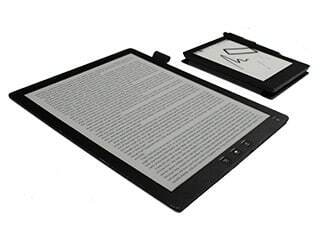 The entire product line of e-readers have been running Android 4.04 which severely limits the number of apps you can install on your device. The new Google Android 4.4.2 update now allows popular digital note taking apps such as OneNote and Evernote to be run directly on the 13.3 and 6.8. One of the big updates was our digital note taking experience. Drawing and writing notes is now 50% faster, which means you have pinpoint precision when using our stock app. The UI has also been overhauled and is more responsive to touchscreen interactions. There is a new sleep screen, which is higher resolution and basically we have remedied over 100 lingering bugs that made the Good e-Reader sluggish at times. Step 01. Download the the firmware update HERE. Step 03. please connect the device to your PC then copy the file to the Root folder (in the mass storage of the device) or the SD card. Step 04. Disconnect the device to your PC after the file has been successfully copied. Step 05. Long press the “POWER” button, and the screen will pop out the shutdown menu. Step 06. Choose “Upgrade by SD-Card” , then the system will restart to go firmware patch process. Step 07. After the patch process is done, device will auto reboot. Step 08. If for some reason this new build is buggy, you can install the latest 4.04 factory file. Just repeat the steps above to install it. You can download the old 13.3 factory file HERE. Would it be possible to provide the old firmware 4.0.4 for 13.3 ereader as a backup if the new firmware failed? I have an Apple iMac and was able to copy this Android 4.4.2 update file to my Good e-Reader by using Android File Transfer. Everything worked and it didn’t take long. I am delighted with the speed of operation and the very capable default Notebook. Thank you, good guys! Thanks! It took a really long time to get this version of Android to work on our hardware and also fix a ton of bugs! We are working on a new update available in the next few weeks that solves some bugs that have been reported here and Indiegogo. your Indiegogo supporsters some of whom have been waiting two years. For me this doesnt work at all. – when i long press i only have the option power off or reboot, no Upgrade by SD-Card. I am on a mac. Tried the Android file transfer, but again no root folder. It would be great if you would put a little extra effort in describing the process. Now my tablet is bricked. – then i went to settings, about this device and it said there is an update available. – I installed the update. Now i am stuck with Encryption unsuccessful loop. Do not update the firmware in the settings menu, if we wanted you to do that, we would have outlined it in the process described above. I was able to do it after reading the comments. Please add that the files needs to be renamed update.zip in the instructions. I am using a Macbook air and I just removed my sdCard, popped it into my mac, copied the file in my home folder, renamed it in ES file explorer app, and updated it. LOVE THE LATENCY ON THE NEW UPDATE…IT IS SO DAMN FAST! Cant wait to take notes on the GoodEReader now…. – Please add a mode for left hand writers which would move at-least the home and back key to the other side. What happens when you put Reset? 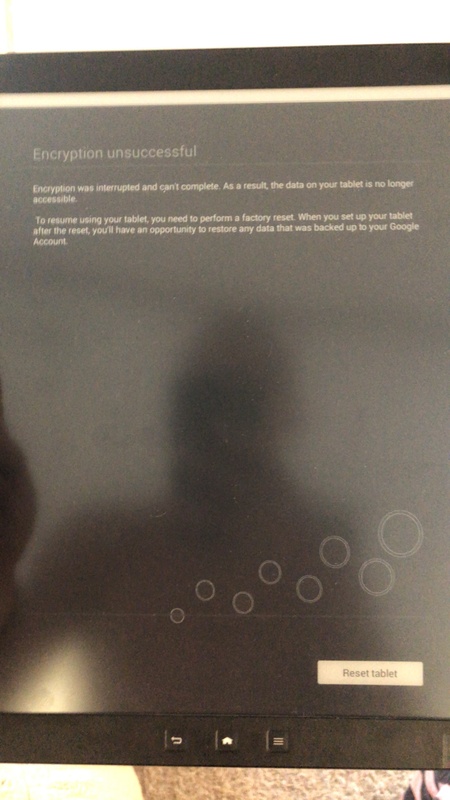 I tried that of course, device reboots and I end up on the same screen. It will be great if you can give me some guidance of how to get out of here. And also warn other people not to do it. Thanks for saying it now. It should be in the instructions as well to not do that as a warning. If a system update, over the air is available on my device I assume its safe. Image apple having an update available and assuming people will not install it. I’m sure you did. I just wanted to know. Thanks for the info. Thanks for asking, hope I can prevent people from making the same mistake! Once updated to 4.4, cannot be downgraded to 4.0.4. The new firmware is so buggy. A lot of time there is no response. The new update may be toward note taking, but not reading e-books. The default pdf reader is gone. It was buggy at times, but at least functional most of time. Now the pdf reader is EZpdf? or Moon Reader. Neither app can turn 1 page at a time. I tried to do factory reset after updated to 4.4, but the issues still remain. Please make downgrade to 4.0.4 possible. It has some bugs, but at least it’s working most of time for reading e-books. When you hold down on the power button to reboot your device, remove your hand from the power button and then press down on the power button again and with your other finger hold down on the home and settings button, so you are holding down multiple buttons at once. This will enter fastboot, in which you can manually factory reset, upgrade firmware etc. We are working on a new update to be pushed out soon. Hi. After the update, I cannot reach my external SD card, nor read the books on it or even see them, although I’ve done the update by copying the firmware to it. Now I cannot read any of my books ??. My e-Reader is of no use to me now, very sad. As in? What’s the holdup and when can deliveries be expected? Communication is poor, I haven’t received a single update to my order EVER. Is there a place to get more info? You guys need new hardware to keep up with Onyx. Hello there, we tried that for hours. It’s not working. – when the device is on, and i hold down the button i get the power menu. If click on turn off device, it just reboots and i am stuck again. – if i select reboot, the device reboots but the key combination is not working. Please advise, is there any support email that can help me, happy to pay for support. Any update video about ink speed improvement? Any date available for the bug fixed version of the Goodereader Android 4.4 update ?? I couldn’t update my device I done all steps but still not showing update menu. You are lucky! It’s better not to update now, this update is full of bugs. Hi, It is possible to have the kernel and bootloader open-sourced such that we hackers can make contributions to the devices? I backed through Indiegogo more than a year ago, and to this day have never received any info on when I might have my 6.8 eReader delivered. No info on production, no info on delays, no info on why there are delays, ZERO INFO AT ALL. Starting to get p.o. here. I’m having trouble accessing or installing the playstore. I can’t log into my google account either. Is there a work around this? Can we flash Magisk on this? etc? Yeah, I think they’re really lacking staff or something. It took almost a half a year to get my 13.3. still has bugs with the software update too. This would be nice. I’d love to see this. I wish they’d respond.